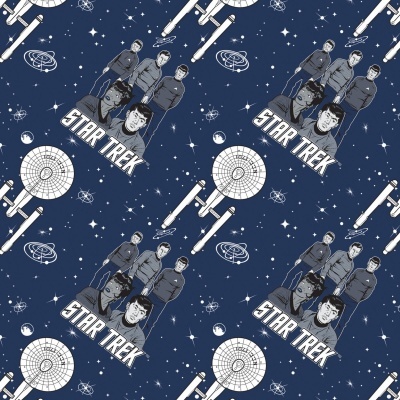 Star Trek design on a navy background, 100% cotton from the Camelot Star Trek Galaxy cotton collection. 112cm / 44" Width, this fabric weighs approximately 150gsm. Multiples of a size will be cut as one piece unless requested otherwise. Lovely fabric. Great quality and soft feel. Shame the designers missed off Scotty & Chekov. Lovely to have the other characters though! This is the first time I have ordered from roof top fabrics, and I was pleasantly surprised. The fabric is a very good quality, the delivery was very quick, and the customer service seemed very good, although I did not really have much need for them. The fabric cost more than I am used to paying, but one has to pay more for good quality, and I'm sure I shall be using them again in the future. I would highly recommend them.